Pick one. Draw it. Make it funny. Dimensions: 7 1/4 x 10 1/4 in. 160 pages. Ages 5 and up. A book for doodling, drawing, and laughing! Featuring the inimitably humorous art of Calef Brown and a wonderful menagerie to stretch and inspire your artistic talent and imagination alike—plus 32 stickers! 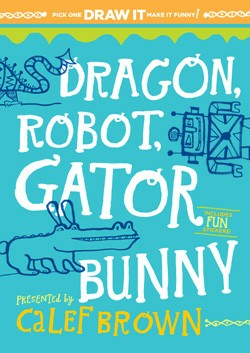 Wildly inventive fun for artists aged 5 to 105.